There is a lot of sadness in the world today. I need to take a moment to acknowledge that before I continue. Black men are being shot because they are black. This is not like the violence I escaped from my marriage. This violence is inescapable. It is institutionalized. In addition to that, one of my dearest friends, Rebecca, the friend who took Reed and me in after I left Caleb, has a friend being held hostage by al-Qaeda. If you have a moment, I implore you to sign this petition asking the American government to help secure his release. [Update, sadly Luke Somers was killed by al-Qaeda during a rescue attempt by US forces]. Again, this violence is institutionalized. Like many Americans today, I feel helpless in the face of all of this. I feel helpless to stop it. I feel helpless in a way that is different from the ways in which I felt helpless in my marriage. A woman who I knew rather well in my hometown, a woman of great spirit, died of breast cancer yesterday, and it is difficult for me to think of someone who always felt so alive being dead. Someone I know in a professional capacity lost her home to a fire, and she has no clothes. Her family was already poor She is one of the sweetest people I know, but I only know her in a professional capacity. I am trying to figure out if it would be appropriate for me to anonymously send her a gift card to a clothing store. I am trying to figure out if that would help or hurt. I am usually crying by the end of a blog post. Tonight, I am already crying. I am crying in the face of all of this helplessness. I am a crier. This is no secret. Crying is not an escape, but it is a release, at least. Helplessness is a painful feeling. I want to find ways to escape it, but I have learned that what I want is not always what I need. Sometimes, I need to collapse myself into the helplessness. Sometimes, I need to admit that there are things I cannot change. There are parts of myself that I will never change. This is true, I know. There are aspects of my life that I will never change. There are things from my past that I will never change. There are actions I have taken that I can never undo. There are things yet to come that I will not be able to change. There was so much about Caleb that I could not change. But that doesn’t mean I didn’t try. I tried so hard. “I’m almost thirty-seven,” I said. Then, they all started chattering, telling me how they never would have guessed I was that old. I would have thought they were just trying to flatter me, if it hadn’t been for their genuine surprise and somewhat tactless comments about how old I was to be a graduate student. I feel vain by even repeating this story, but here is why it mattered so much–In all my years of teaching during my marriage, none of my students ever expressed surprise at my age. In fact, I think they usually thought I was older than I was. Because I was older than I was. I carried the abuse in my body, in my soul, and in my eyes. I spent the entirety of my marriage looking and feeling ten years older than I was. I aged twenty years in ten. And since leaving Caleb, I feel as though I have reverse aged. My skin looks better. My eyes glow again. My hair is thick and healthy. I have more energy. I sleep more soundly. I am not a new person. I am the person I always was. I am the person who was being masked by years of abuse. I had a difficult week. I won’t go into the details, but it was the kind of week where I was being very hard on myself. Feeling very inadequate. I talked on the phone to my mom. Have I mentioned lately how great my mom is? We weren’t always close, although we always loved each other, but I feel very close to my mom now. For the first time in my life, I feel as though I’m completely honest with her. I feel as though she knows the real me. And that is different because, for a long time, if I couldn’t be exactly the person she wanted me to be, then I didn’t want her to know who I really was. This is because, as I have been informed by my counselor, I’m an approval seeker. Finding this out was a surprise to me, although it seems to have surprised no one who knows me. I’m an approval seeker, so I’m constantly seeking approval from others, even in situations where no approval will be forthcoming. And I was telling my mom how dejected I was feeling, she told me “You need to stop being so hard on yourself. You need to stop being so hard on yourself because Reed is going to see it, and he’s going to be hard on himself too.” And the hard truth for me is that Reed is hard on himself. He gets frustrated when he doesn’t get a perfect score on a spelling test, and I tell him “We don’t have to be perfect, buddy!” in my best peppy “mom” voice, but I don’t think he hears it when he sees me constantly striving for perfection in my own unattainable ways. And I’m tired of trying to be perfect. And I felt like I’d been punched in the gut. The list of things that would make him “never be happy” felt endless. Above all, I could never make him happy. Reed could never make him happy. Our home could never make him happy. Our dogs could never make him happy. Our family could never make him happy. 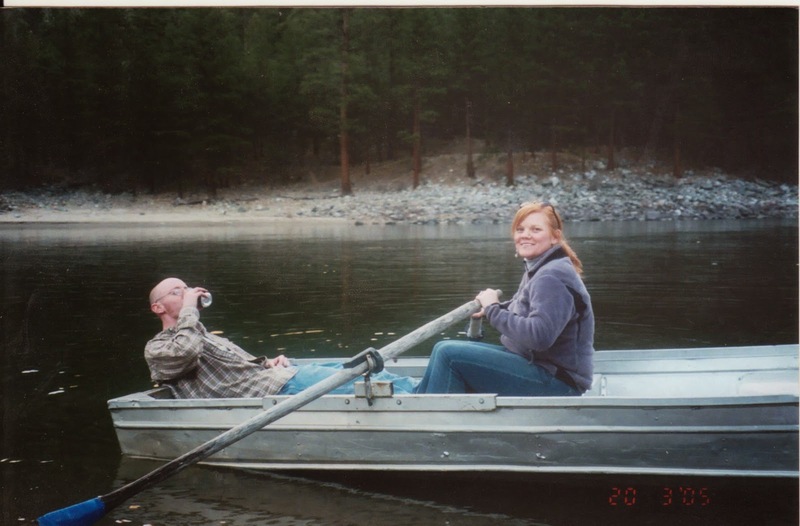 I felt like I was always rowing a sinking boat upstream. I was rowing, and he was just along for the ride. Now, all of a sudden, he’s happy with who he is? That is what I craved. Above all, I craved his happiness. I spent so little time thinking of my own. But I couldn’t make him happy, so I was helpless. I was helpless in the face of his unhappiness. As my friend, Megan, who is a counselor, has pointed out to me, the “I’ll never be happy if I don’t have a wife who is not happy with me all of the time” statement is the statement of a master manipulator. He basically told me that I could never be unhappy, never be annoyed, never be sad, never be angry, never be upset. And when telling me that didn’t work, he showed me. He showed me this with his fists. There was a night. A terrible night where he beat me in the head so badly that my scalp swelled, and my arms, which I had raised over my ears, bruised. I am tired of telling these stories. I am so tired of telling these stories, but I don’t know how to tell my story without telling these stories. He hurt me so badly, then he went to bed. And I stayed up for a long time. And I went to my computer, and I wrote a counselor who had been referred to me by Caleb’s counselor, a man who had been counseling us as a couple, but to whom we hadn’t divulged the abuse. I wrote to her from my work email address because I knew that Caleb could read my personal email. I wrote to her and told her that my husband was beating me, and that I had to tell her right then before I lost my courage. I had never even met her. I was operating on faith. And then I went to bed. I went to bed with him. And the next morning, he rolled around and put his arm around me, and I flinched and pulled away from him, and he asked what was wrong? He claimed not to remember what had happened. He didn’t deny that it had happened. He could see the bruises, but he claimed not to remember. Then he told me with deep sadness how much it broke his heart that when he touched his wife, she flinched. He told me this with deep remorse, and I reached out to him and comforted him. I believed that he had blacked out, that he hadn’t been himself, and I comforted him. And when I checked my email, the counselor had written back, and she had told me to go and see her ASAP. And I saw her that afternoon, and I showed her the bruises, and she held me–this stranger–and I wept on her shoulder. I wept for myself, and I wept for him, and I wept for my marriage because, even though I didn’t know I knew it yet, I knew that my marriage was ending. And that night, my husband made a comment about the night before. He was angry that I had gone to see the counselor. I had told him that I had shown her the bruises. His comment was about something he shouldn’t have remembered (if he had truly blacked out), and I said, “Wait, do you remember?” And he claimed not to, but I saw it in his eyes. I saw a cold, hard gleam in his eyes that showed me he did remember. He was lying to me. He lied to me so many times. He lied to me so many times that I had no idea what to believe. After I left him, I had a somewhat heated communication with one of his female friends. She asked me why I stayed past when things got dangerous. I tried to explain to her that she didn’t have the right to ask that question of me, that she was victim-blaming me. I was angry and didn’t explain myself very well. But here is why I stayed past when it got dangerous: I stayed because he lied to me. I stayed because I believed him. I stayed because his abuse was so slow, so insidious, that I didn’t know it was happening. I stayed because he gaslighted me so much, that, by the time things got truly dangerous, I didn’t believe my own perceptions anymore. I only believed what he told me. I stayed because he brainwashed me. This woman had been a victim of stranger assault, so I had thought she would have some understanding of what I had been through, but I have learned that other assault victims do not necessarily understand what all assault victims are going through. I don’t know what she went through, and she doesn’t know what I went through. She doesn’t know how it feels to be lied to, manipulated, and gaslighted over a period of years by the person who you love the most. I don’t know how the look in a stranger’s eyes changes when he becomes dangerous. She shouldn’t presume to think she knows what my experience was like, or what could have prevented it. And I shouldn’t have presumed to think that she would understand because she had been assaulted herself in a different fashion. And how does this connect back to my needs? I don’t really know, honestly. These blog posts always take me on a path of their own. They are different from the rest of my writing, more organic, more like a path that I follow than a path I carve, so now, I don’t really know how all of this connects back to my needs. I guess it connects because this is what I needed to say. I have learned that I have a hard time distinguishing between what I want and what I need. Last night, I had a lot of grading to do, but I was also very tired. And I thought that the grading was what I needed to do, but I wanted to sleep. And I slept. And here’s the thing: the sleep was what I needed. The grading waited. It waited until today, and I finished it by the skin of my teeth. But I had needed sleep, and I had given myself the thing I needed. And I need to be easier on myself. And I need to be able to recognize what I need. For so long, I didn’t even know what I needed because my needs were so focused on his. I have gotten pretty good at recognizing my needs. I give myself little mantras to help. After I left Caleb, I called 2013 “The Year of Asking For What I Need” and I was given everything I needed. It was like a miracle the universe had bestowed on me. Much to my mother’s dismay, I am not religious, but I almost could be after that year. Everything I needed came to me, including a last-minute acceptance to the top PhD program in the country, and I learned, once and for all, that I could survive on my own. I called 2014 “My Honey Badger Year” based on this video. Rebecca wrote to me recently, “I’ve rarely known someone with such a combination of fierceness and softness,” and that was maybe one of the best things she could have said. I have worked so hard to access that fierceness. Fierceness without hardness. That is what I want for my life. I also called 2014 “The Year of Saying Yes,” and I’ve said yes to almost every opportunity presented to me. It has paid off. In the past year, I’ve had an essay go viral, met tons of new writers, landed a top-notch agent (No, seriously, like really top notch! ), had breakfast with editors at fancy publishing houses, traveled across the country, made new friends, kissed men who weren’t Caleb, started turning my assemblage of writings into a real book, and, basically, lived the life I’ve always dreamed of. And it turns out that life makes me tired. I started this post crying, but I am no longer crying.